Simon wrote Circ in collaboration with nine other writers for the Ten To One project. Razvan Popescu lives in a flat overlooking the seaside town of Skegness. He keeps himself to himself and few know the man at all. Even fewer know his past, which he has tried to leave behind in the Romanian woods. But when a tattooed man is found murdered on the beach, it is clear that some of that past has followed him to this tacky seaside town. As battle erupts within the criminal fraternity, dark forces gather around the town and Popescu’s acquaintances find themselves dragged into a world of violence, fire and fairy tales. One thing is certain: the circus has come to town. Ten To One is a novel writing project in which ten authors write a novel together, seeking the approval of a judging panel and a public vote to keep their character in the story. Fans of Simon's writing will be happy to hear that his character, Mungo the Clown, was voted winner of the Ten To One project. 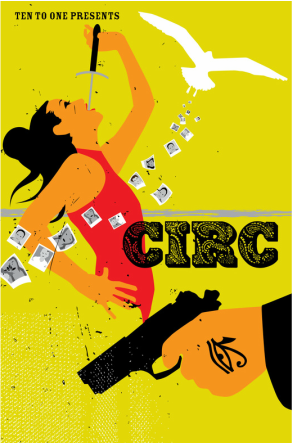 Circ, the first Ten To One novel, is written by Simon Fairbanks, Maria Mankin, Yasmin Ali, Jason Holloway, Livia Akstein Vioto, Luke Beddow, Danielle Rose Bentley, William Thirsk-Gaskill, Sue Barsby and Giselle Thompson. Circ is available for Kindle and in paperback. The Circ book launch took place on Friday 28th November 2014 at the Library of Birmingham.